The nice thing about pork tenderloins is that you usually get two in a pack. At my house that means two different meals featuring two generous portions of scrumptious flavor. It roasted in a 500° oven for just under 20 minutes and was done to perfection. You may have noticed that one of my favorite vegetables is butternut squash. I had half a squash left from another recipe, so I decided to experiment. I made butternut squash and sage ravioli. Pureed squash, a little ricotta and rubbed sage bound with a beaten egg made the filling. I used wanton skins to hold the filling. I use small wanton skins to made individual lasagnas and am very happy with how that turns out. The brand of skins I had this time were very thin. They got a little soggy even before being boiled so they were not the most attractive ravioli I’ve ever made. Next time, I’ll hunt a thicker wonton. 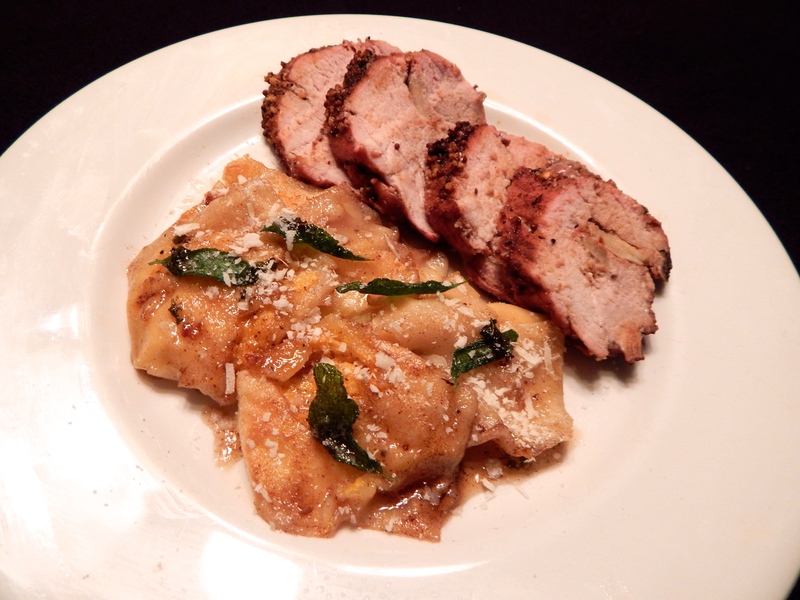 I made brown butter flavored with a garlic clove and some minced fresh sage and gave the ravioli a quick toss and turn before plating them. I then spooned some sage butter over them and garnished them with fried sage leaves. Great flavor. Next time, they’ll be more attractive! Porchetta is an Italian pork dish described as fatty, herb stuffed, rolled and roasted over fire. Herbed rolled and roasted seems to be the common denominator regardless of the region of Italy it comes from. It can be served as a meat dish or sliced in sandwiches as street food. Wherever you find it, it is a special treat. I was happy to find a “weeknight porchetta” that used a pork tenderloin instead of a whole pig. When the silverskin has been removed, the tenderloint is rubbed with a paste of chopped garlic, rosemary and fennel seed, wrapped in bacon and set on four sprigs of fresh rosemary in a roasting pan. Four heads of garlic are cut in half horizontally and nestled around the loin. All is drizzled generously with olive oil. About 40 minutes in a 425° oven, a 10 minute rest and it is ready to serve. The pork should be about 16o° when done. A roasted garlic clove smeared on each bite is a nice savory touch. With the porchetta, I served grilled radicchio wedges. The wedges were basted with a combination of olive oil, lemon juice, coriander and red pepper flakes. The oiled wedges were based on one side, and grilled, turned once and basted again. When the radicchio was soft and had a little char, it was removed form the pan and set aside while the porchetta was sliced and plated. The radicchio was added to the plate and drizzled with a reduction of balsamic vinegar and honey and then sprinkled with crumbed ricotta salata. Sorry the plate looks monochromatic, Next time I’ll add something green for color. Both the pork and the radicchio were good enough to say there will be a next time. I knew Sunday would be busy so I made a Sunday dinner on Saturday night. I had a couple of lamb shanks from Tierra del Sol, a farm and packing company at Fort Hancock east of El Paso. They raise and pack lamb and goat meats. They have a booth next to our Master Gardener booth at the farmer’s market. I treat myself to their products now and then. I ordered lamb shanks at the end of summer and saved them in the freezer until now. Lamb shank topped with gremmolata on a bed of seasoned white beans in a red wine pan sauce. My shanks were pan browned, then braised for a few hours in a sauce based on a mirepoix (carrots, celery and onion) tomato paste garlic, thyme, red wine and chicken broth. While the lamb braised, I made another mirepoix shaved on a grater and microplane. I sweated the vegetables then added drained and rinsed cannelloni beans, chicken broth, grated garlic and a bay leaf. This mixture simmered and thickened with a few massed beans to make a base for the shanks. I made a gremmolata – finely chopped parsley, lemon zest and garlic – to top the shanks. When the shanks were done, I set them aside and tented them with foil. I strained the pan sauce and returned the liquid to the pan, added a couple of Tbsp of unsalted butter and let it simmer and thicken a bit. I put the base of beans in a flat soup bowl, added the shank, spooned some sauce over it letting some surround the beans and sprinkled the the gremmolata on it with a little on the beans for more color. I opened the fridge to explore breakfast possibilities. There, still staring me in the eye, was a package of refrigerated pie dough begging to be used before its expiration date. There were a few strips of bacon and some shredded cheese in the meat bin; and a partial carton of egg substitute and a few tablespoons of El Pinto green chile sauce in a jar on the top shelf. A plan was born! I diced the bacon and put in in a cold skillet with about 1/4 cup of water. Cooking the bacon in water renders the fat without spattering all over the place. When the water is evaporated, the bacon crisps nicely in its rendered fat with minimal mess on the stovetop. I blotted up some fat with a paper towel and added about 1/4 of an onion, diced. While the oven softened, I smoothed one roll of pie crust. I used a cereal bowl as a template and pressed three circles into the crust. I cut the circles out with a paring knife and reserved the dough scraps. I repeated this action with the second crust. I gently combined the left over dough into a ball and rolled it out thin. I was able to make two more dough circles from the scraps and only had a tiny scrap to toss out. Meanwhile, the bacon have finished crisping and the onion was tender. I added a minced large clove of garlic to the pan and let it bloom for about a minute, then added the green chile sauce – about two generous tablespoons. I evaporated the liquid off the green chile and added two eggs beaten with a half cup of egg substitute and proceeded to scramble the mixture. when it was set and mostly dry, I added a handful of shredded cheese and stirred it into the eggs. I put a generous tablespoon of egg mix onto each dough circle, brushed the perimeter of the dough with beaten egg and folded the dough over on itself. I crimped the edge of the little pie with a fork to seal it, stuck three vent holes in the top with a paring knife and brushed the surface with beaten egg. 15 minutes in a 450 oven produced beautifully browned breakfast pies – empanadas in Spanish, pasties in the UK. I’m sure most cultures have a similar savory pie, but I don’t know all those names. I had eight pies. I was able to fit six on a rack set on a half-sheet baking sheet. I baked the last two directly on the surface of a quarter-sheet pan. I like the way the pies cooked on the sheet turned out better than the ones on the rack. Breakfast pies right out of the oven! Savory scrambled egg breakfast pies with bacon, onion, garlic and cheese and a flaky golden brown baked crust with a side of ridgeback sliced orange makes a good Saturday morning breakfast. Note the orange, too, please. I sliced the ends off the orange, made a vertical cut on one side and rolled the orange open while carefully separating the sections. When opened on the plate, I call them ridgeback oranges. Not only was this a delicious breakfast and I got some things out of the refrigerator as nice bonus. Prokofiev had it right when he composed Love for Three Oranges. Winter citrus is a very special treat. Growing up our Christmas stockings always had an orange, some nuts and candy, a holdover from when oranges were only available in winter in rural Texas. They were always anticipated with relish. Today, we’re more fortunate. We have oranges and grapefruit year ’round and in the winter we get some seasonal varieties to add excitement to those cold days such as Cara Cara, Moro blood oranges and Meyer lemons. This morning, I celebrated a my love for three oranges and a grapefruit. I peeled and sliced the citrus fruit and popped it under the broiler for a few minutes until the citrus sugars developed full flavor and the fruit got a little char. Broiled Pink Grapefruit, Cara Cara Oranges, Navel Oranges and Moro Blood Oranges are sweet on the eye and on the palate. I love the broiled citrus as a breakfast side. It is also wonderful topped by a scoop or two of vanilla ice cream. A small ham and cheese omelette, whole grain toast and broiled citrus are a good way to start the day. What to do on a snowy day? We had a cold snap today. I went out for the paper about 6:00 a.m. and it was windy and starting to get damp. By 7:00 a.m. snow was starting to stick and El Paso was starting to panic. Mountain roads were closed, streets were getting slick and reports of car crashes were on the news flashes. We don’t handle snow and wet very well here. It was a good day to stay off the streets, hike down to the doublewide and think about a big bowl of something. I wasn’t in the mood to go to the store, so I went to the cupboard to see what was there. When I found a bag of Anasazi beans, I knew what to do. Anasazi beans are an ancient bean grown by pueblo dwelling farmers in the southwest. They are now grown commercially and are readily available in New Mexico and Arizona. They have a pale background marbled by cranberry colored lines. When cooked, they darken and look like pale pinto beans. I used a quick cook method for them. I boiled them in plain water for 15 minutes, then turned off the burner and let them sit a half hour. They began to absorb the water and start to get tender. This technique substitutes for soaking them overnight. After that half hour, I drained them and added fresh water to cover them and poured in 1 Cup of chicken broth. I brought them to a boil and reduced them to a simmer. After they got “going good,” I added a chopped onion, a couple of crushed garlic cloves and two or three diced slices of bacon and let it all simmer for a couple of hours, checking for doneness along the way. When the beans were done, I turned the burner to its lowest level, added a pinch of salt to the pot and let them stay warm a while longer. Next I made skillet of cornbread. I use my step-grandmother’s cast iron skillet that has been used only for corn bread since before I was born. It is perfectly seasoned and I will have her haunt anyone who messes with that pan. At last the corn bread was done. I dished up a bowl of beans, topped it with a generous side of corn bread with a dab of butter and a spoonful of green chile sauce — just the way to end to a snowy day! Cornbread makes me think of my grandfather. One of his favorite suppers was a tall glass of buttermilk and crumbled up cornbread left over from lunch. It took me a long time to learn to like buttermilk. As a senior citizen, I like a glass now and then. With a salute to my grandfather’s memory, my dessert was a short glass of buttermilk with cornbread and a grind of black pepper. Cornbread and buttermilk with a grind of pepper – pure goodness from the doublewide. By the way, I had to cross town to pick up someone at the airport. The wind stopped around 7:00 p.m. and so did the snow. It is now 10:45 p.m. and streets are clear and most of the snow has melted. Bad weather seldom lasts long in El Paso. Sift dry ingredients into a medium mixing bowl, or, you can also stir them with fork until the white and yellow ingredients are a uniform color. Whisk egg, milk and oil together. Melt 1-4 tsp butter in a an 8-9 inch cast iron skillet, pour in batter. Bake 25 minutes or until a straw or tooth pick inserted into the bread comes out dry. Rest pan on a rack for 10 minutes and invert onto a plate. Slice and serve. *If you have Yankee ways about you, you could add 2-4 Tbsp sugar to the dry ingredients. Then you might as well drench it in syrup or molasses. If you like good cornbread, you will skip the sugar. All it really needs is a generous pat of butter. I’m a Texan. I’ve done something very unTexan. I made a vegetarian chili. I ate it. I liked it. Forgive me CASI (Chili Appreciation Society International). I read a headline for Butternut Squash Chili. Butternut may be my very favorite squash, so I read it all. Squash, onion, garlic, salsa, cumin, chili powder, cannellini beans (another favorite) cinnamon, cayenne pepper. The clincher was unsweetened cocoa powder. It didn’t make it taste like mole. Rather it just made the whole experience a little richer. Butternut Squash Chili garnished with avocado and Greek yogurt. The chili is a little on the sweet side, rich tasting and has enough chili zip to satisfy my chile loving palate. I’ll be surprising my daughter Emily the vegetarian with this one! Next time I make it for me, I might add a little bulk chorizo and have an omnivore experience! Heat oil in a large soup pot for about 1 minute. Sauté onion and bell pepper until onion is soft – about 5 minutes. Stir in garlic and for a minute then pour in wine. Let the wine bubble a moment, the stir and loosen any fond (brown bits) from the bottom of the pot. Add squash, beans, tomatoes and juice, salsa and water. Blend in spices. Bring chili to a slow boil and then reduce the heat and let simmer, stirring occasionally, until squash is tender and the chili begins to thicken. Add up to a cup more water if the soup looks too thick. Serve topped with a dollop of Greek yogurt and a sprinkle of diced avocado. I woke with a craving. Actually two – red chile and green chile. Fortunately both were on hand. I wound up with stacked red enchiladas with an egg and my chile relleno taco treat. Good way to start the day! I love chiles rellenos (stuffed chiles), but I don’t like the mess of frying them, so I frequently bake them in browned panic crumbs and an happy with the results. Somedays, however, even that’s too much like work so I make chile relleno tacos. Quick plus easy and they satisfy that chile and cheese craving. I am lucky enough to be near a store that roasts chiles every day all year long. I take them home, peel them and have some in the fridge almost all the time. Stem peeled chiles, seed them if you like. That good chile heat is in the veins and stems. Stuff with a good melting cheese – today I used the Colby-Jack that my kids called tiger cheese when they were small. Heat a skillet and spray it lightly with cooking spray. Fold your stuffed chiles in corn tortillas and gently lay them in the heated pan. When the cheese has begun to melt, lightly spray the tops of the tacos and turn them over. Using a light spritz of oil in the pan and on one side of the tacos helps them take on a little color, but doesn’t fry them crisp. I turn them back and forth until I am happy with the color and then plate them. Sometimes, I top them with a fried egg and they become fork and knife food. If you are really energetic, a side of refried beans is a great complement. I have a daughter who is vegetarian. I’m always on the lookout for dishes I can make for her or that I can share with her. I test them in the Gringo Gourmet Academy Test Kitchens. The latest trial was Eggplant Meatballs. I’m happy to report that the test kitchen tasters found them delicious. The “meatballs” are baked eggplant, mashed white beans, onion, garlic, parsley, parmesan cheese, panko crumbs bound with an egg. They are baked in a 375 degree oven. When you turn them upside down, the bottoms are nicely browned and they look meatbally. I served them on a bed of whole grain pasta and jarred fire roasted tomato sauce and a sprinkle of grated parmesan cheese. Also on the plate is a skinless, boneless chicken thigh “cutlet” breaded, pan browned and finished in the oven with the “meatballs” and a salad with calamata olives and ricotta salata and an Italian-ish vinaigrette. The chicken was the last from a frozen tray of thighs used in another recipe. As an omnivore, I was a bit skeptical about the “meatballs” and the cutlet was my backup. For this meal, I considered the “meatballs” a vegetable side. Next time I will be happy to consider them the entrée. I found the recipe is in the current Food Network Magazine. The issue includes a recipe for a butternut squash chili that I’ll try and one for sweet potato millet burgers that I’ll consider. It has sweet potato, millet, garbanzo beans, Hatch green chiles and southwestern spices. The chiles may be the deciding factor here, not to mention the search for millet in El Paso. We’ll let you know how they fare in the Academy Test Kitchens.